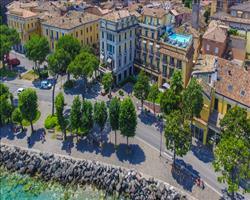 Driving directions to and from Desenzano in Italy. Before driving to Desenzano in Italy, check local traffic laws to ensure you're carrying mandatory driving equipment (a set of requirements for driving in Italy). Each country has different laws - a big fine for being poorly equipped is an easy way to squander the saving you made on your superb value Sno holiday! NB: If you are not confident driving, don't risk it - book an airport transfer with one of the incredibly skilled and incredibly good value local drivers.